Busy week on the road highlighted by a Program Review visit to Washtenaw CC. WCC Team is transitioning to Lumens and making a variety of changes to position Economic & Community Development (ECD) to meet the needs of their community. I was very impressed by the Sales Process WCC has documented, as well as their success with Community Enrichment. ECD is responsible for a Conference Center and making it affordable but financially self-sufficient. All employees and their dependents, as well as community members 65+ can take classes for free. Also they can only pay one instructor rate which is higher than the average rate I have come across. Both are financial challenges but ECD is confronting them head-on. 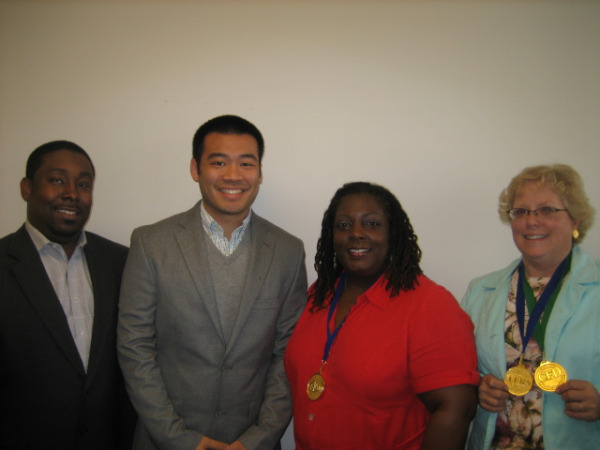 Photo: Brandon Tucker (on the left) and some members of the ECD Team (notice the CPP bling! ).